2004-03-09. New. Ships with Tracking Number! INTERNATIONAL WORLDWIDE Shipping available. Buy with confidence, excellent customer service! 1976-05-04. New. Ships with Tracking Number! INTERNATIONAL WORLDWIDE Shipping available. Buy with confidence, excellent customer service! 1986-05-05. New. Ships with Tracking Number! INTERNATIONAL WORLDWIDE Shipping available. Buy with confidence, excellent customer service! Wiley. Hardcover. 047141526X BRAND-NEW, Unread Copy in Perfect Condition. FAST UPS shipping (you'll receive your order within 1-5 business days after shipping in most cases*), this helps to ensure your order arrives in perfect condition. PLEASE NOTE: FedEx does not generally deliver to PO Boxes or APO addresses, so please be sure to give us a physical street address to deliver to; also, unfortunately, we cannot ship this item to Alaska or Hawaii. THANKS! *(this applies to domestic shipments within the continental US - other destinations may take longer) . New. 2004-03-09. Good. Ships with Tracking Number! INTERNATIONAL WORLDWIDE Shipping available. May not contain Access Codes or Supplements. May be ex-library. Shipping & Handling by region. Buy with confidence, excellent customer service! John Wiley & Sons. PAPERBACK. 9971510480 New Book. Sixth Edition. Yellow and green cover. Purchased from long time Charlotte bookstore(all new books) liquidation sale. While at the sale, I noticed many of the books were being pulled out of old boxes at the back of the store. Many of the books had obviously been in shop for many years--many quite rare. This is one of those books. Very rare in new condition. NOTE: Books ordered before 11AM Eastern Time shipped same day. Your satisfaction is guaranteed. We will instantly refund your money if you are not happy with the book for any reason. . New. Wiley. Hardcover. 047141526X New Textbook, Ships with Emailed Tracking from USA . New. 2004-08-03. Good. Ships with Tracking Number! INTERNATIONAL WORLDWIDE Shipping available. May not contain Access Codes or Supplements. May be ex-library. Shipping & Handling by region. Buy with confidence, excellent customer service! Wiley. Hardcover. 047141526X New Condition *** Right Off the Shelf | Ships within 2 Business Days ~~~ Customer Service Is Our Top Priority! - Thank you for LOOKING :-) . New. Wiley. Hardcover. 047141526X Like New Condition. . Fine. Wiley. Hardcover. 047141526X New Condition. . New. 2012-08-03. New. Ships with Tracking Number! INTERNATIONAL WORLDWIDE Shipping available. Buy with confidence, excellent customer service! Wiley. Hardcover. 0471111813 New Condition. . New. Wiley. Hardcover. 0471111813 Like New Condition. . Fine. Wiley. Hardcover. 047141526X US Edition Textbook, May Have Highlights, Notes and/or Underlining, BOOK ONLY-NO ACCESS CODE, NO CD, Ships with Emailed Tracking from USA . Good. 2012-08-03. Good. Ships with Tracking Number! INTERNATIONAL WORLDWIDE Shipping available. May not contain Access Codes or Supplements. May be ex-library. Shipping & Handling by region. Buy with confidence, excellent customer service! Wiley, 1995-07-26. 7. Hardcover. Used:Good. Wiley, 2004-11-11. 8. Hardcover. Used:Good. Wiley. Hardcover. 047141526X Brand New ,Original Book , Direct from Source , Express 5-8 Business days worldwide Delivery. . New. Wiley. Hardcover. 0471490210 Like New Condition. . Fine. Wiley. Hardcover. 0471490210 New Condition. . New. 1971-07-08. Good. Ships with Tracking Number! INTERNATIONAL WORLDWIDE Shipping available. May not contain Access Codes or Supplements. May be ex-library. Shipping & Handling by region. Buy with confidence, excellent customer service! John Wiley & Sons, 1958. This is an ex-library book and may have the usual library/used-book markings inside.This book has hardback covers. In poor condition, suitable as a reading copy. No dust jacket. 1995-06-04. Good. Ships with Tracking Number! INTERNATIONAL WORLDWIDE Shipping available. May not contain Access Codes or Supplements. May be ex-library. Shipping & Handling by region. Buy with confidence, excellent customer service! John Wiley & Sons, Inc. Used - Acceptable. Shows definite wear, and perhaps considerable marking on inside. 100% Money Back Guarantee. Shipped to over one million happy customers. Your purchase benefits world literacy! Wiley. Hardcover. GOOD. Spine creases, wear to binding and pages from reading. May contain limited notes, underlining or highlighting that does affect the text. Possible ex library copy, thatâll have the markings and stickers associated from the library. Accessories such as CD, codes, toys, may not be included. 1986-05-05. Good. Ships with Tracking Number! INTERNATIONAL WORLDWIDE Shipping available. May not contain Access Codes or Supplements. May be ex-library. Shipping & Handling by region. Buy with confidence, excellent customer service! Wiley. Hardcover. 0471490245 New Condition. . New. John Wiley & Sons. Hardcover. 0471874744 New Condition. . New. 1976-05-04. Good. Ships with Tracking Number! INTERNATIONAL WORLDWIDE Shipping available. May not contain Access Codes or Supplements. May be ex-library. Shipping & Handling by region. Buy with confidence, excellent customer service! John Wiley & Sons Inc. Used - Good. Ships from the UK. Shows some signs of wear, and may have some markings on the inside. 100% Money Back Guarantee. Your purchase also supports literacy charities. 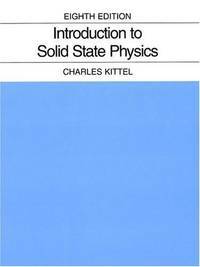 Introduction to solid state physics. New York: John Wiley & Sons, (1971). 766 pp. Fourth edition. Publisher's black cloth in black, grey, & white d/j. D/j rubbed, creased, and with short tears. Very good copy. Wiley. 1953. Hardcover. Very Good. Very Good Very good Wiley; Hardcover, former owner's book plate on front en d page; l ight shelf wear, light fading to cover; otherwise in very good co ndition wi th clean te xt, tight binding. .